You guys know that one of my favorite packing tips is to pack REVERSIBLE stuff. I have written so many posts about reversible clothing for travel that I probably sound like a broken record. So yeah – I guess I have a lot to say on this topic! Turns out I STILL have more to say. Allow me to introduce you to the reversible tote bag. 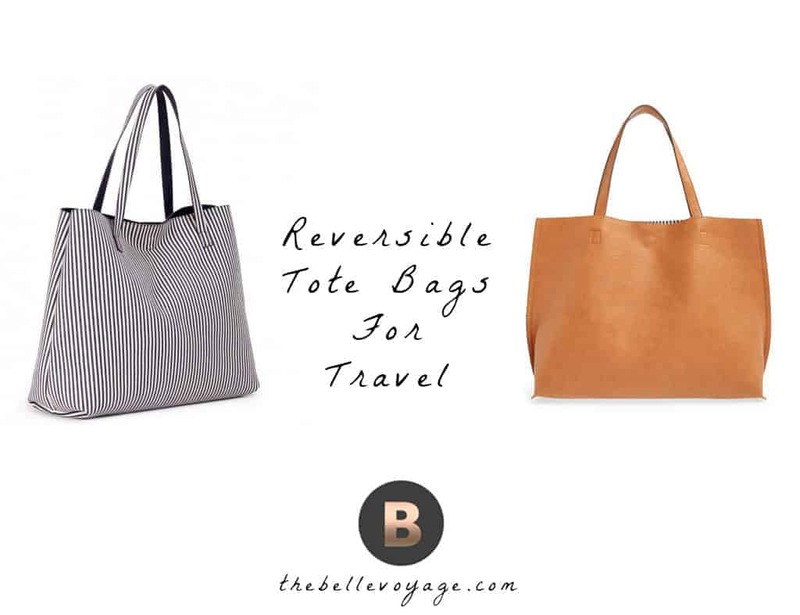 By reversible, I mean a tote bag that switches from one color (or pattern) to another. Giving you a heaping two bags in one – which is obviously unbeatable in the name of all things travel. Yeah, you read that correctly. I was pleasantly surprised to find so many affordable options out there for reversible tote bags. Target carries a reversible tote bag that comes in a TON of different color options. 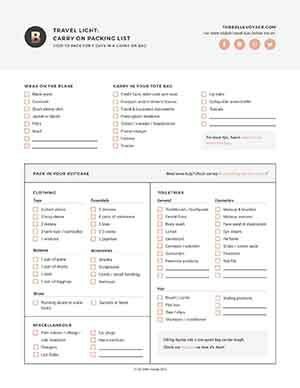 It’s also a budget-friendly $37 so there’s really no excuse NOT to get one. Urban Outfitters carries a cute reversible tote that has really pretty metal detailing. You can also fold down the top of the bag to have both colors show at the same time. It’s a steal at $54, and I love the brown/turquoise option! Street Level makes a vegan option carried by Nordstrom that is only $48, and comes in SIX different reversible options. Juuuuuust in case you can’t pick one. Oh and it also comes with a matching wristlet, which is awesome. So that’s like…..3 bags in 1. I love the navy/taupe option, since I haven’t seen that many other places. If you’re interested in a designer reversible tote, you’re in luck – since it seems like couture is beginning to embrace the reversible trend. Gucci makes a reversible tote that changes between black and a pattern so it’s super versatile. And if that’s not enough – Valentino makes a rockstar stud reversible tote that reverses from black to cognac. I guess having a 2-in-1 handbag helps justify the $3,500 price tag? The bag style is one of my favorites, though – I love the edginess that the studs add to the otherwise classic shape. I’ve had my eye on one for a while, but it wasn’t until researching this post that I knew there was a reversible edition. Blogging can be such a learning experience. I have this thing for laser-cut details. I have a dress with laser-cut trim on the bottom, and I reeeeeeally considered buying a leather skirt with a similar pattern. I think the cutouts are just so, so unique and pretty. So imagine my delight with this laser-cut reversible tote bag that switches from charcoal gray to navy. This faux leather reversible tote has chic woven leather (or not leather, I guess) detailing that creates a really cool pattern. The fact that it comes in mint green is just the icing on top. Here’s another reversible tote that has a cross-body strap detail AND reverses to a metallic color – which is a win in my book. I mean – SHOW me something that this wouldn’t go with. Finally, this reversible tote is possibly my favorite. It’s reversible between a neutral color (cognac), AND rose gold! I have a rose gold obsession that is no secret, so this bag is feeding the addiction. Oh also, the bag is only $40 so that is a huge bonus. Maybe I’ll get two, one in each color – HA. For more of my favorite travel accessories, check out these phone charging wristlets and the perfect handbag to go with your suitcase!